Brian Stelter on Jussie Smollett: The narrative has once again changed from victim to villain back to victim, it's been very confusing...people don't know what to believe and we may never really know what happened on that street in Chicago. Cool. Were you there that night? Smollett's camp says he was the victim of a hate crime. The police dispute that. There isn't video of the alleged attack. Thus, we may never know what really happened. Talk about an awful, no good, very bad day for CNN’s Reliable Sources host and walking Twitter ratio Brian Stelter. 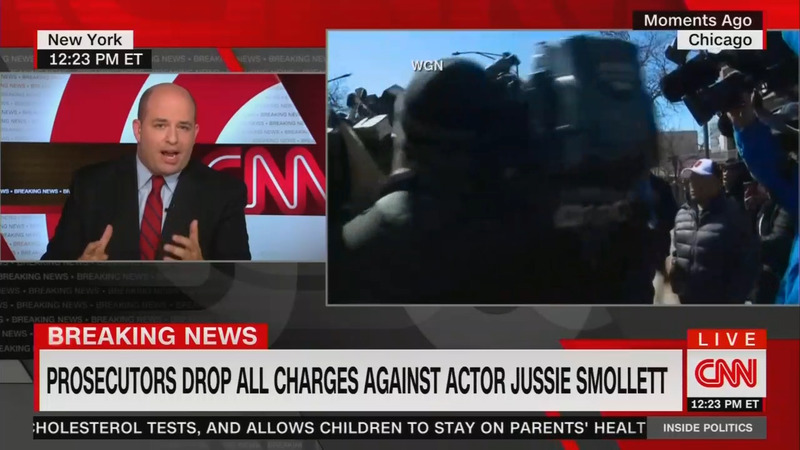 On Tuesday, Stelter peddled the arguments in favor of Jussie Smollett during two CNN shows, suggested Smollett will now go down as “the victim” in all this. And to make matters worse, Stelter took to Twitter and got ratioed into orbit by suggesting those still critical of Smollett should watch themselves because none of us were actually there that night in Chicago when whatever happened took place. Yes, we’ll get to that infamous tweet, but let’s go first to what this very unreliable journalist said on-air. First flagged by our buddy David Rutz at the Washington Free Becaon, the most nonsensical set of on-air comments came during Inside Politics when he told fill-in host Nia-Malika Henderson that the “a key part of the story” is that Smollett can “get back to work” as an actor. [T]he narrative has once again changed from victim, you know, to villain, back to victim. It's been very confusing...People don't know what to believe and we may never really know what happened on that street that night in Chicago, but for his fans, for his friends, this is a triumphant moment that he can now get back to what he wants to do, which is work.